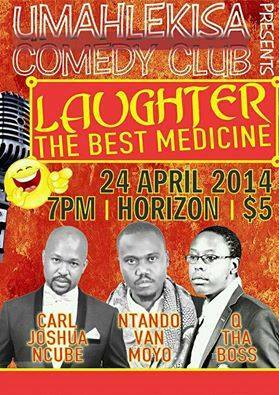 Popular Umahlekisa comedy club will today host Laughter the best medicine at the Horizon Bar at 7pm for only $5 you will laugh until your bones break. The show will star award winning and multi-talented comedian Carl Joshua Ncube, two time nominee Ntando Van Moyo and Ma 1 show host Q tha Boss. Speaking to Van Moyo this afternoon he promised comedy lovers that the show will leave everyone asking for more.